Monday night saw Selby win a stunning Betfred World Championship final, one that was peppered with drama and saw him come back from 10-4 adrift to beat Higgins 18-15. It gave him a third world title and there could be plenty more success to come in Sheffield for the 33-year-old Leicester cueman. Higgins predicted before and after the final that Selby could rival Hendry’s haul. In response, Selby said he was “not sure about that”, but then spoke as though he sees it as a realistic goal. “That’s fantastic for John to say that, and I respect him as much as anyone in the game. He’s a great guy, one of the all-time great players, and for him to say that about me it’s a great accolade to have,” Selby said. “If I keep putting myself through another two weeks like that I’m not sure I can get to another four, but as long as I keep enjoying it, keep putting the hard work in which I will do, then you never know. Selby was drained by his semi-final win over Ding Junhui and made a wretched start to the final, but once he won the final three frames on Sunday evening to close the gap to three frames, momentum switched towards him. The 17-day tournament is often referred to in snooker circles as a marathon of the mind. “It’s such a hard tournament to win, physically,” Selby said. “Mentally it’s one of the toughest sports in the world. Selby became the fourth to defend the title, following Steve Davis, Stephen Hendry and Ronnie O’Sullivan. 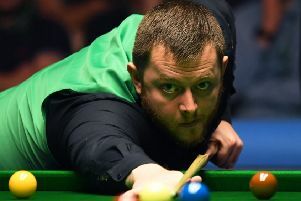 Higgins has won it four times, most recently in 2011, and gives himself a chance of a fifth next year. ut he wants to see a challenge come from players left in Selby’s shadow by his success. “Ronnie’s in his forties, myself in my forties, I think we are still good players but age is maybe catching up a little bit and it’s up to the likes or Neil Robertson and Judd Trump and Ding to really challenge him,” Higgins said. “They’ll have been watching that and seeing Mark move on to three and some of them have not won one so that’ll probably make them desperate to get back on the practice table and stay in touch. “I still think I can come back here and do well.